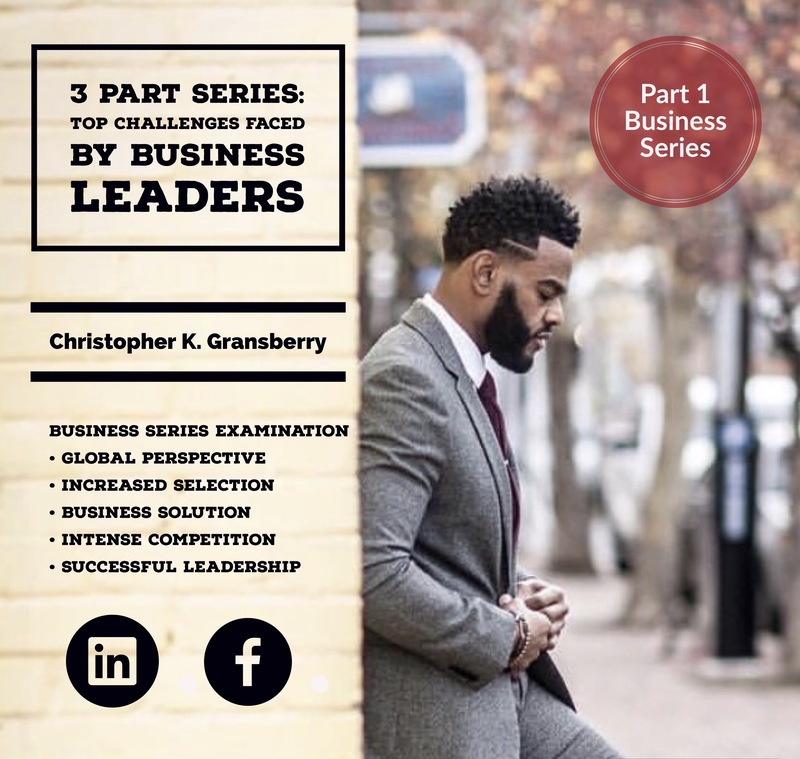 Part 1: Top Challenges Faced by Business Leaders – Christopher K. Gransberry Sr. In the existing business environment, it is much easier to start a business. In the past, one would wait for weeks or months and be required to fill multiple forms to start a business. Today, one can simply purchase a domain name and register his or her business online and is immediately in business. Sustaining the business has become a much more complicated matter. This is because while it was very expensive and time consuming to seek advice from business professionals it is currently very easy to find many experts online who will readily provide information regarding whatever business one intends to start. These experts, like myself provide information on how to start online stores, potential problems that can be encountered, how to solve them, among other pertinent information, with all information at very affordable prices. The ease and convenience of starting a business has consequently resulted in the creation of a wider scale of market place competition according to indications noted by Gentry, Ecker, Stawiski and Zhao (2015). Presently, it is possible to find many businesses competing for every product a business is dealing with, as well as a new business that deals in a single item and dedicates all its resources and efforts to be the best at this one item. This increase in the overall selection as well as increased competition is a top challenge many business leaders are grappling with because it has become increasingly difficult to retain customers since they can easily and abruptly switch suppliers. Thus, it is a battle of focus, marketing and perception as averred by Nejati (2010). For a leader to succeed, he or she will have to master these elements and give a business system that supports a one-on-one engagement with the customers the resources whereas information can be exchanged on what the customers would prefer. This way, prices can be negotiated, perceptions can be altered, and marketing can be accustomed and highly inclusive through the incorporation of previously ignored services.